We frequently receive calls from customers inquiring about the “black specks” on their vinyl siding and wooden decks. Artillery or shotgun fungus has become an increasing problem throughout the U.S. especially during the spring and fall when the ground is moist most of the time. Artillery fungus, or shotgun mold, is a wood-decay fungus that likes to live on moist landscape mulch. The worst thing about this fungus is that it shoots spores up to 20 feet, which often land on siding, cars and anything else that surrounds the mulch. Though the specks appear to resemble insect feces or possible air- borne pollutants, they are actually mature spore masses expelled from fruiting bodies of a fungus. During the last decade, the “artillery fungus” has emerged from an interesting mycological curiosity that grows in landscape mulch to a problem of major financial concern to homeowners, insurance companies, mulch producers, and landscape contractors. This common inhabitant of landscape mulch produces sticky spore masses (gleba) that it shoots towards the light or towards reflective objects such as light-colored automobiles or house siding. mulches blended with 5% compost, cedar mulch, and mulches commercially designated as “bark” but containing considerable wood, dyed wood chips, non-dyed wood chips, cypress mulch, large bark nuggets, and 100% spent mushroom substrate. The mulches obtained from large piles shredded blends of bark and wood supported significantly greater levels of artillery fungus sporulation than did other mulches. Such highly susceptible mulches should be avoided if the artillery fungus is to be minimized. In contrast, large bark nuggets, cypress mulch, and 100% spent mushroom substrate supported less artillery fungus. Can Artillery fungus be completely removed? 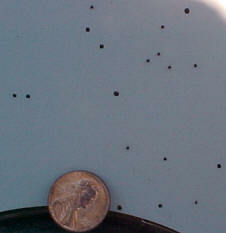 Unfortunately, the black spores from the Artillery fungus pose a stubborn cleaning and removal problem. The end result typically leaves light black or brown spots on the cleaned area. And the longer the fungus has been allowed to spread, the likelihood of any results are minimal. A professional power washing company will also be able to give you treatment options. Although it is extremely difficult to remove the mold once it is on your siding or other surfaces, there are ways to prevent it from spreading further. Change to a rot-resistant mulch such as cedar, redwood or cypress. Add a new layer of fresh mulch that completely covers the old. Avoid mulches made of wood chips or ground up wood pallets. Treat the mulched area with an EPA approved fungicide. Ask your landscapers or mulch provider what type of mulch they use. To learn more about Artillery Fungus and how to remove it, give us call. We would be happy to come out and access your property.